Style is different for everyone. Some people want to sport high fashion on the city streets and always have their eye on what’s going down the runway. Others take a more simplistic and affordable approach to filling up their closet. For men and women who want something stylish, rough around the edges and affordable they can easily find themselves shopping with MMA Sharp! The eCommerce shop recently teamed up with OC Designs Online for a sleek and stylish look to their online eBay and Volusion stores. By partnering with OC Designs Online for both shops the store theme and layout was easily mirrored on both shop sites building a strong brand image. The header of this eBay shop design sets a cool tone for the shop by using various shades of blue. The store logo can be found in the top left hand corner with a brief description of the store specialty right below the store name. Directly to the right online shoppers can view a perk and benefit from shopping at MMA Sharp. The stores free shipping policy on all orders will be sure to light up the eyes of many customers. Below the store logo and free shipping notice online shoppers can find a blue panel listing out store categories with individual tabs. Each tab has the store category in a white font making it easy to view with a navy blue background. For moments when customers have a specific item or inquiry on their mind they can turn to the search tab in the far right hand corner of the panel. This tab allows customers to search inventory and items easily and bypass skimming products to make purchasing quick and to the point. The Volusion header above resembles the header from the eBay shop. A few differences are that the category tabs in the blue panel have somewhat of a bolder font to make the categories pop from the page. Also, with Volusion customers are able to login and register through the site in the very top right hand corner. The tabs in the top right hand corner vary slightly. The Volusion store header allows customers to track their order instantly whereas the eBay store header allows online shoppers to sign up for the shop newsletter to remind customers to come back for more! The common trait with both tabs is that MMA Sharp is geared toward keeping customers satisfied and happy while walking out the door feeling stylish and ready for the day. 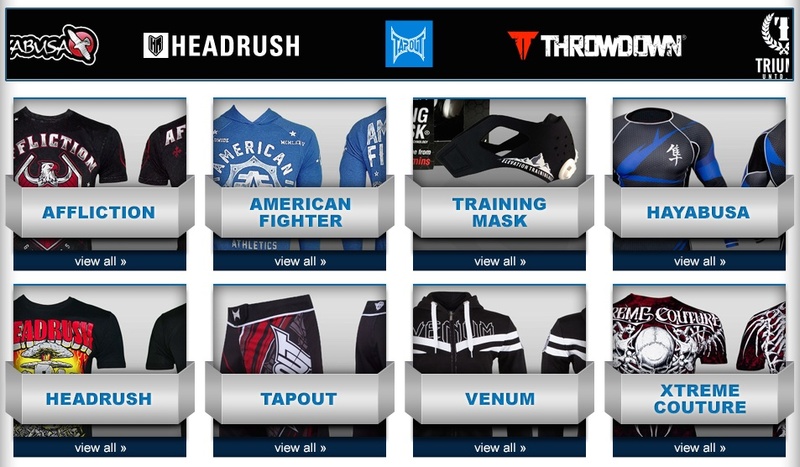 The midsection of both the eBay store and Volusion shop focus on the top clothing brands found within MMA Sharp! The top panel has brand names scroll from the right to left making it easy to catch the shoppers eye. Top names like Headrush and Throwdown will have customers heads rushing with joy and throwing down their favorite items into their digital shopping cart. The midsection is the same on both sites keeping for a uniform shopping experience and simplistic shopping approach. Each tab highlights the clothing found within each category with a high resolution photo along with a bold blue font introducing the clothing. If the shopper wants to view the products described by the tab title they can either click on the image or simply click the “View All” tab in the bottom of each store category tab. The footer of this eBay shop design is all about putting store inventory in the spotlight! The featured items section can easily bring specific products to the attention of the customer. This section can be beneficial toward sale items, new inventory or for just highlighting items people may often overlook. The featured items section in this Volusion store design for MMA Sharp keeps with the theme of the eBay design. The products in each section are different to make sure shoppers see a variety when it comes to store inventory. The eBay shop design offers customers a “Buy Now” tab whereas the Volusion store offers an “Add to Cart” tab. However, both enable the customer to checkout quickly and with ease. The tabs host a picture of the product since online shoppers rely on accurate visuals. A brief item description and price is found within each product tab so that the only thing left is choosing an appropriate size! OC Designs Online takes customization and brand identity to the next level. The MMA eBay store design and MMA Volusion template design are prime examples of how shopping can be made easy and fun while maintaining a common theme for both shops. There’s a design template for everyone and sales are more likely to soar when shopping is simplified through design. Come browse our portfolio and then request a free quote.